A well-known Tlingit artist and a renowned art historian have been chosen to judge Sealaska Heritage Institute’s next Juried Art Show and Competition, which will open in May and be held during Celebration 2018 in June. The institute’s Native Artist Committee, which is comprised of celebrated Northwest Coast artists who guide SHI’s art programs, recommended artist Jackson Polys and art historian Steve Henrikson to serve as jurors. Master Haida weaver Delores Churchill also has agreed to serve as a juror consultant on sewing and weaving submissions. The jurors will tackle the tough job of choosing winners of the show, which was first held in 2002 to encourage and enhance the creation and production of Southeast Alaska Native objects of artistic value which have fallen into disuse and are becoming rare; to stimulate and enhance the quality of artistic work among our Native artisans; and to encourage the development of new forms of art of purely Southeast Alaska Native form and design. SHI will award prizes in five divisions: Carving and sculpture (wood and metal carvings and sculptures); sewing (skin and fur, beadwork and other); weaving (Chilkat, Ravenstail and basketry); and two-dimensional (paintings, drawings and prints). The Juried Art Show will open in the Nathan Jackson Gallery at the Walter Soboleff Building on May 15, 2018, and run through Sept. 30, 2018. Artist applications for the show are due Jan. 16, and winners will be announced June 6, the first day of Celebration 2018. Celebration, a biennial dance-and-culture festival sponsored by SHI every even year, is scheduled to run through June 9. Jackson Polys is a visual artist who lives and works between what are currently called Alaska and New York. His work reflects examinations into the limits and viability of desires for indigenous growth. He began carving in Saxman with his father, Tlingit artist Nathan Jackson, from the Lukaax.ádi Clan of the Lkóot Kwáan. He was adopted into the Dakl’aweidí Clan of the Jilkáat Kwáan and worked as a visual artist as Stephen Paul Jackson and Stron Softi. He was featured in solo exhibitions at the Alaska State Museum and the Anchorage Museum before receiving a B.A. in Art History and Anthropology and an MFA in Visual Arts, both from Columbia University, where he taught from 2016-17. During this time, he was an advisor to Indigenous New York, the collaborative program initiative co-founded by Mohawk artist Alan Michelson and the Vera List Center for Art and Politics. He is recipient of a 2017 Native Arts and Cultures Foundation Mentor Artist Fellowship. 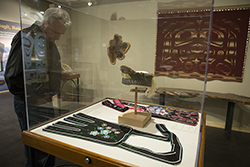 His individual and collaborative works reside in collections at the Burke Museum, City of Ketchikan, City of Saxman, Field Museum, Goldbelt, and the Übersee Museum-Bremen and have been exhibited at Artists Space, Hercules Art/Studio Program, the James Gallery, Ketchikan Museums, and the Sundance Film Festival. Steve Henrikson has served as curator of collections at the Alaska State Museum and adjunct instructor at the University of Alaska Southeast for more than a quarter century. In 1986, he came to Alaska as a seasonal curator at Sitka National Historical Park during a break from graduate studies at the University of Washington. Previously, he earned degrees in history and anthropology from Portland State University. Henrikson’s work and life keep him deeply engaged with Alaska art and artists, with history and history makers, and with cultures and their descendants. He preserves, researches, develops, and exhibits Alaska’s permanent collection—30,000 historical and cultural artifacts and artwork. Henrikson serves on the board of the Alaska Humaniteis Forum and as a Tlingit Clan Conference organizer. He works extensively with Native elders, artists and cultural experts, scholars, and the general public. He and his museum colleagues also consult with communities and museums statewide on museum construction and operations, including the community of Klukwan in the planning of its new cultural center. Henrikson is an adopted member of the Dakl’aweidí Clan (Killer Whale) clan of the Angoon Tlingit and participates in clan ceremonies. He was the 2016 winner of the Governor’s Award for Distinguished Service to the Humanities. Delores Churchill is an eminent Haida weaver who is an expert in gathering and preparing materials for cedar bark, spruce root, and Chilkat weaving. She learned much of the art from her mother, Selina Peratrovich. As a teacher, Churchill has been instrumental in revitalizing the endangered ancient practice of spruce root weaving throughout the region. Churchill’s weavings are exhibited in museums throughout the world. She also works as a researcher and consultant. Her awards include a Rasmuson Foundation Distinguished Artist Award, a Governor’s Award for the Arts, an Alaska State Legislative Award, and a National Endowment for the Arts Creative Artist residency. The Walter Soboleff Building’s artist-in-residence space, located near the exhibits area, is named for Churchill, who serves on SHI’s Native Artist Committee, which guides the institute’s art programs.